The Cascade Room In Vancouver BC has started a fairly new dining series called “Mates of the Long Table”. 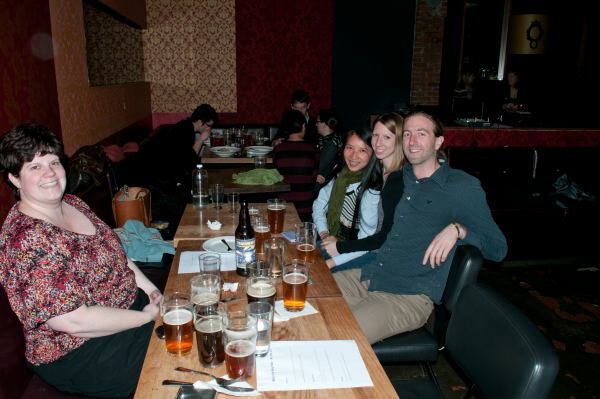 On the third Wednesday of every month the put on a long table dinner which features a 3 course meal with 3 full pints of craft beer. 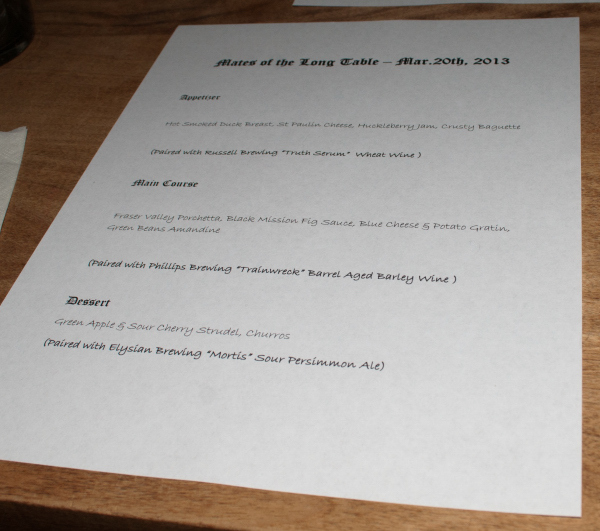 The dinner on March 20th, 2013 was the first Long Table dinner my Girlfriend and I have attended at the Cascade room. The cost was $35 (around $38 with fees) for the dinner. This nights dinner was a fairly small affair with only 12 participants. From what I hear there are usually closer to 20 people for these events (could be because of spring break). 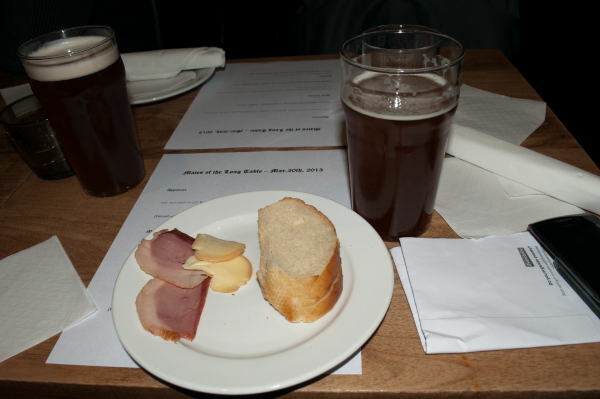 I was lucky enough to sit across the table from Jack the head brewer out at Russell Brewing in Surrey BC. The night started with a quick introduction by one of the staff members at the Cascade Room (Sorry I cant remember his name) about how the night would go. Jack from Russell Brewing then introduced all three beer that we would be drinking during the dinner including a beer from Russell Brewing, Phillips Brewing and Elysian Brewing. Food was served to the table on platters for the table to share. 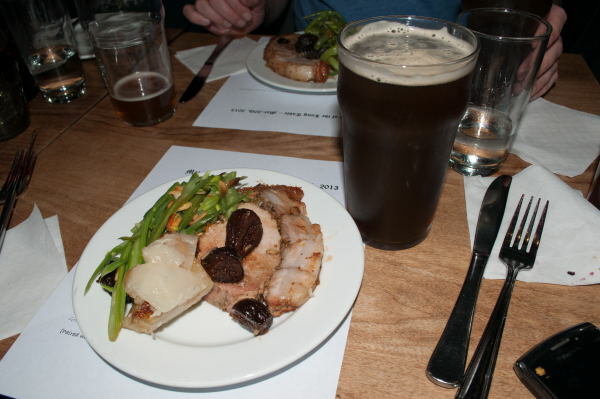 Every course served was cooked with the beer it was being paired with like most long table and brewmaster dinners. Up until this night I had only had duck once and did not like it. You always have to be open to trying things again though so I dug in. The duck was amazinly tasty as well as the cheese. It may sound weird but putting a piece of duck, cheese and some huckleberry jam on top of a baguette was amazingly tasty. The sweet jam paired well with the savory flavours. Having the slight sweetness and of the jam went really well with the Truth Serum Wheat Wine quite well as it has a sweetness and fruitiness on top of a good body and hops bitterness. Until this dinner I had never heard of a Porchetta but man was it tasty! Some times you just need a really savory fatty cut of meat! The porchetta went very well with the fig on top of it. The green beans had lots of flavour as well. Not being a fan of blue cheese I was a little worried about the potato gratin but man was I impressed with these potatos! They were a more refined scalloped potato and tasted amazing. The Trainwreck went well with this dish as the food had lots of flavour to pair well with a strong flavorful brew. This beer has also started to age really well and has lost some of its edge. The brew on the left is the Mortis. This dessert was a great surprise as it seems most dinners like to fall into safe things like stout cakes. 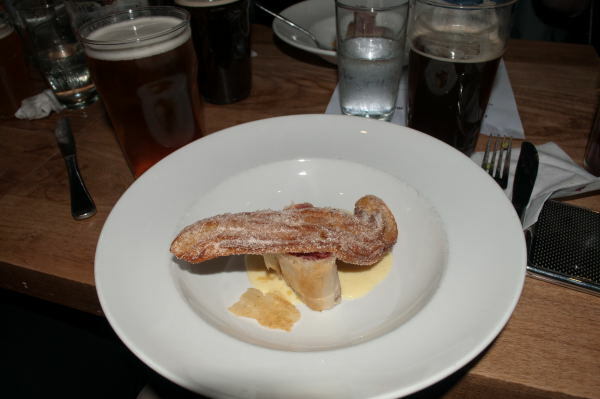 The churros was full of flavour and the strudel was slightly sour just like the Mortis beer that uses Brettanomyces (wild yeast). Neither had a huge sourness but just a nice hint. I would love to east this dessert every night with a glass of Mortis! This was an amazing dinner and I am pretty sure that everyone involved was stuffed when we were done eating. One thing with these dinners I love is that my girlfriend does not drink so I get her beer. This was a bit much at this dinner with all imperial drinks but I managed most of the brews haha. It was a treat to eat with Jack and the others at our table this night and I hope to run into them at the next dinner as I plan on being there! If you are interested in checking out one of these dinners make sure to check out the Cascade Room’s website and follow them on twitter at @thecascaderoom. This entry was posted in Brewmasters Dinner and tagged 3 coarse, barleywine, bc, beer, beer dinner, canada, cascade room, churros, dinner, elysian brewing, food, group, long table, long table dinner, phillips brewing, porchetta, russell brewing, seattle, smoked duck, sour beer, strudel, surrey, the cascade room, vancouver, victoria, wheat wine.